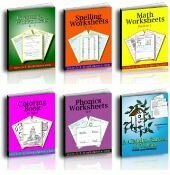 A list of adjectives and worksheets. The positive, comparative, and superlative: comparison of adjectives. We have both worksheets and explanations about using adjectives on this page. 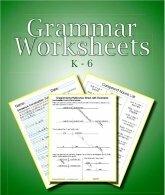 These free Grammar downloads have several adjective worksheets with space to copy the words. 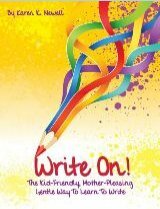 My favorites here are the positive, comparative, and superlative worksheets. 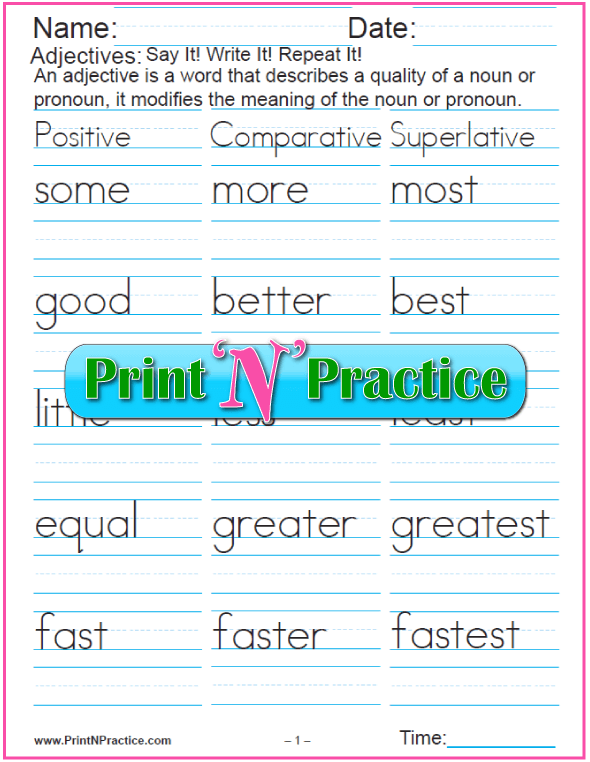 They give some children a real boost in spelling words that end in -er for comparative adjectives and -est for positive adjectives. 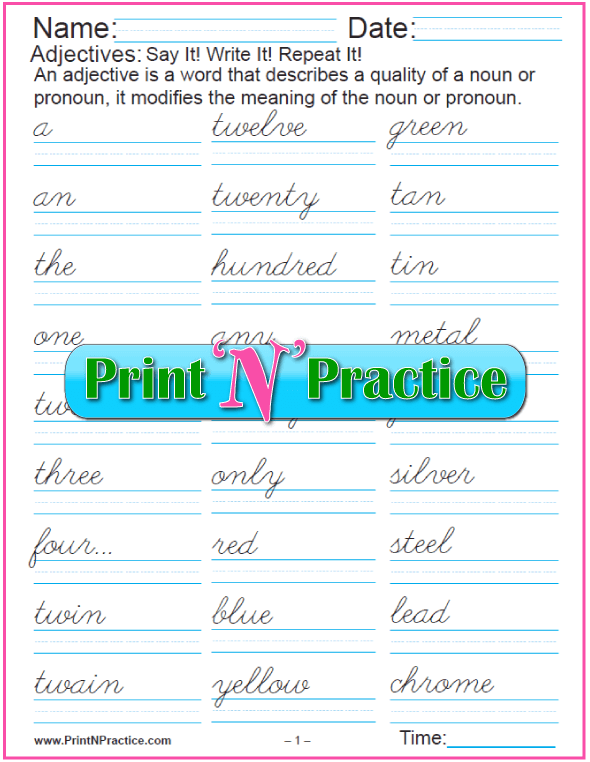 They can be used for teaching the spelling rules and for handwriting practice in both manuscript and cursive writing. Adjectives - An adjective is a word that describes or defines a quality of a noun or pronoun, it modifies the meaning of the noun or pronoun. I like red apples. The adjective “red” describes the noun “apples”. Adjectives are descriptive words that qualify or quantify a noun. Comparison is a variation of the adjective to express different degrees of quality: positive, comparative, and superlative adjectives. This is true of adverbs as well. The usual comparative form adds –er and –est to the positive form. Follow the spelling rules for adding endings that begin with a vowel in the cases of words that end in silent final e or end in the vowel y. Add –er to the positive to make the comparative form, and add –est to the positive form to make the the superlative form. When the word ends in y or silent final e follow the rules for adding endings that begin with a vowel. Double the last consonant for a 1-1-1 word (one syllable, one short vowel followed by one consonant) since the endings –er and –est begin with vowels. Adjectives and adverbs that have three or more syllables are prefaced with more/less (comparative), and most/least (superlative). Positive adjectives that add the ending –ish express the diminutive, or suggest a small amount: brownish. Prefacing positive adjectives with rather or somewhat gives a diminutive effect as well. Preface these words with more/less and most/least for the comparative degree and the superlative degree. Good is an adjective and well is an Adverb; both positives form their comparative and superlative with better and best (good, better, best; well, better, best). Some adjectives cannot be compared since they represent an absolute degree: square, infinite. 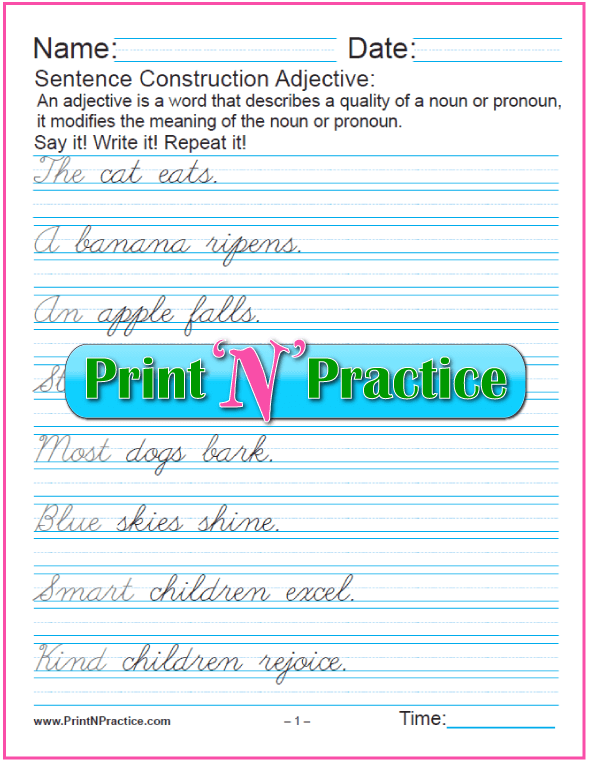 4 Pages Positive, Comparative, Superlative Cursive Adjective Worksheets. 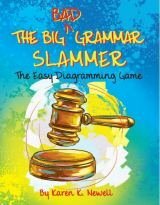 Demonstrative Pronouns – this, that, these, those, former, latter, both, same, yonder. Distributive Pronouns – each, every, either, neither. Indefinite Pronouns – all, any, another, certain, enough, few, little, many, much, no, none, one, own, other, several, some, which, whichever, whichsoever, what, whatever, whatsoever. Some Pronomial Adjectives can be compared like descriptive adjectives: few, fewer, fewest; little, littler, littlest, much, more, most. There are three classes of numeral adjectives: cardinal, ordinal, and multiplicative. Adjective Phrase - An adjective phrase is a group of words that do not form a clause, because they do not have both a subject and a verb, yet describe the quality of a noun or pronoun. A prepositional phrase can be used as an adjective phrase to modify a noun or pronoun, or as an adverb to modify a verb an adjective, or an adverb. The boy in green is one of her brothers. Boy is a noun described by the adjective phrase in green and of the prepositional phrase of her brothers. Adjective Clause - An adjective clause is a dependent clause that describes the quality of a noun or pronoun and is introduced by a relative adverb, a relative pronoun, or a relative adjective which makes it a relative clause as well. She has improved her vocabulary since she has studied so hard. The relative adverb since starts the adjective clause. 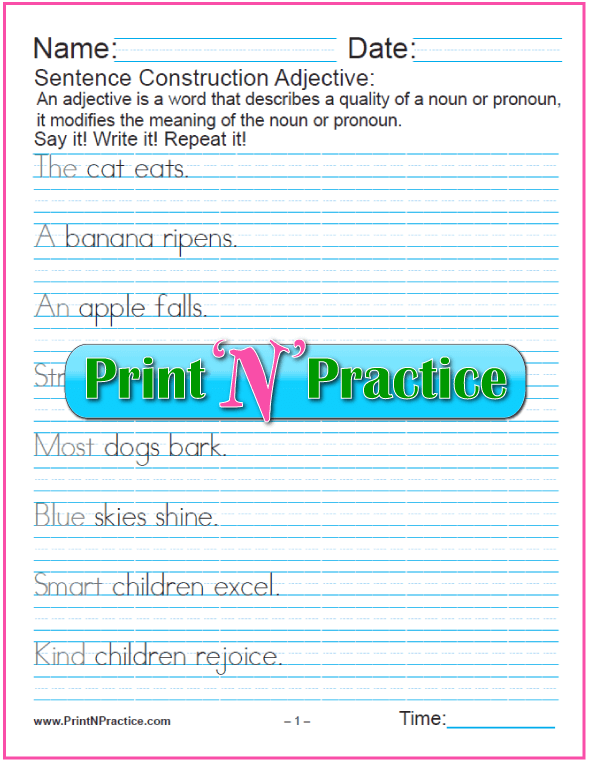 You might also like our noun worksheets and printable adverbs worksheets. 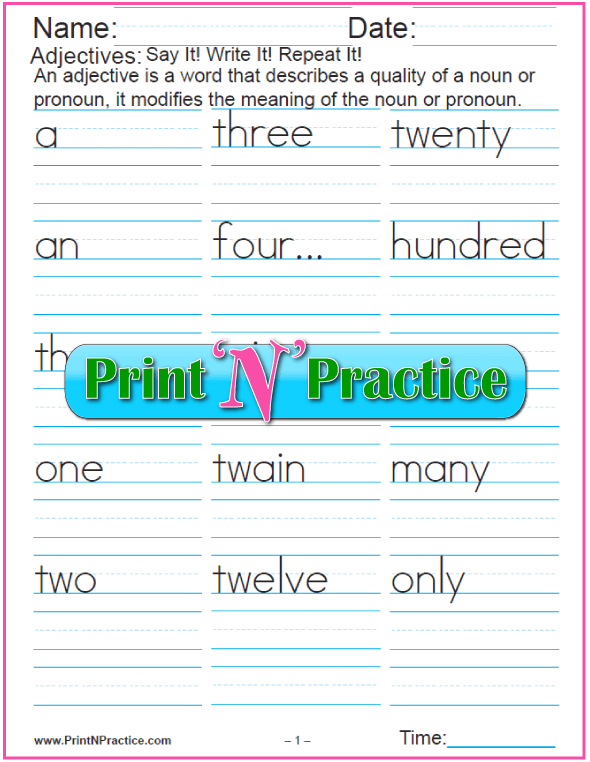 Thank you for visiting our printable adjective worksheets.